“Spiritual demands can create stress”. Was the name of an article in the Christian Daily here in Sweden. Tommy Dahlman discovered that the Church is not a sanctuary from stress… Tommy tells us that there are many reasons why we experience stress, it is not only related to the hours that we work… He addresses that one of the reasons is the sense that we have to be available and in touch with our world around us at al times. • 50% – 60% of church planters close the plant and the effort dies. • 90% say their Bible School/Seminary Training did not prepare them for what they face day-to-day in the church. • Only 10% finish the race and reach age 65 as a pastor. • Two-thirds say their congregation has been in conflict in the past 2 years. • 80% of pastors’ spouses with their spouse would choose another profession. • Nationally 1,500 pastors leave the ministry each month due to burnout, moral failure, or conflict in the church. That’s 18,000 per year! • 50% of those who begin in the ministry leave after their first pastorate in less than 5 years never to return to ministry though they felt called. I know stress since I live with it to some capacity on a daily basis. I don’t know if one can live without the trials of stress, stress is experienced in many different ways, in responsibilities, assignments, relationships, social circumstances, and finances, in connection to our perception of us and so many more situations and dimensions. And what about the demands of Jesus as he calls us to leave everything behind and follow Him… Following Jesus implies a certain degree of stress as He challenges us to be changed in His image… the whole process of sanctification can be experienced as a stress related development. Every change I am exposed to is in its essence a possible stress factor in my life. For Christians there is yet another dimension of stress: and that is the fight in the spiritual world… when becoming a Christian one leaves the “kingdom of darkness” behind and becomes part of the Kingdom of light (or God). The Bible tells us that there is a constant battle going on as our enemy Satan will try to do everything possible to kill, quench and destroy us. The spiritual warfare is real and claims its toll. The problem is that many Christians and leaders in the West are not aware of this warfare thus being unprepared and unprotected against it. Another aspect that I want to call our attention to is the fact that we are people with many passions. Too many passions! Following Jesus is learning to becoming men and women with few passions in life. Passions demand loyalty, time, resources, attention and energy… The fact that so many are burned out and are “stressed to death” can also be found in the fact that we have too many passions. Be a person with few passions and your life will be less stressed. The earlier mentioned research among leaders showed that support, empathy and teams are lifelines in ministry and to keep your sanity. However, I guess that we will always battle with stress and its consequences. Since the fall of humankind conflict is a part of life (see article on conflict and leadership), conflict within, among and over creation and us. The challenge is to learn to “give our conflict, struggles, trials, stress and challenges to God” which, at times, is easier said than done… I am still in the school of life trying to throw myself into the hands of my master! Downshifting – making time more valuable, life less stressed and money less needed… and the Kingdom more visible! 3. To simplify or reduce one’s commitments in (one’s life). The whole idea of downshifting is to work on the quality of life by doing more with less, by consciously choosing to reduce intensity of life, earning, spending and accumulating things. It is reaction against consumerism which tells us to accumulate things, experiences, money and property. In a couple blogs I have earlier written about consumerism and its consequences… Downshifting is about making other priorities; naturally it has to do with the whole area of consumerism, but also about other priorities. What would happen if the members in the churches would downshift their involvement in the workplace and commit themselves a few more hours a week in ministry to people around them (and other ministry opportunities and needs)? Personally I know of a few people who have downshifted in their involvement in their workplace and instead have committed themselves to ministry. Can you imagine the tremendous impact it would make if many of the members in our churches would do so? An incredible flood of people with tremendous gifts and abilities would suddenly become available for the ministry of God in our nations and cities. Instead of trying to find some space in their agenda’s to plan in “church” and “church-activities”, people will find themselves with more time at hand which means; less stress, healthier balance, time for family, friends and ministry! The quality of life might change completely and… the peace and presence of God might become more visible because of a life in balance. Just a thought… who takes it to heart? 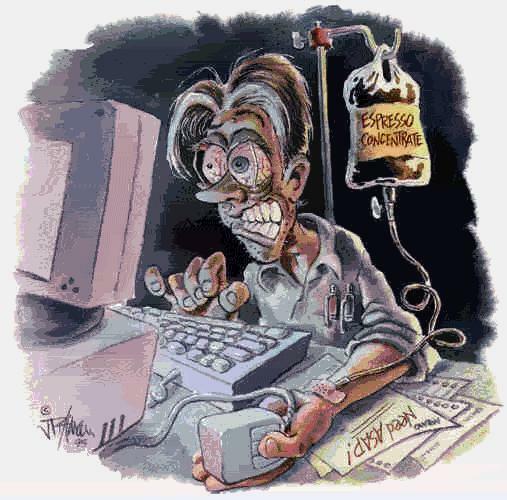 Blogging; it’s all about stress, self-esteem, mammon and identity. Svenska Dagbladet caught quickly the latest news in the technological blog world about how blogging leads to stress and can end up in death. The New York Times technology edition addressed blogging, and the blogging lifestyle as a potential dangerous activity. A couple of people died most probably as a direct result from their intensive lifestyle. Svenskan conclude their analysis with some clear pointers addressing how the world of blogging is actually a high risk phenomenon. The constant flow of information, the need to always be on top of things and the sheer (financial) value of being first out on the internet with the latest issues creates an inhuman environment which deteriorate life quality to the max. The blog world and people’s response to it is in a way attractive; some makes the big bucks (maybe tens of thousands of blogger make their living this way) – they are driven by the money. One minute can make the difference between a so-so pay of a coupe of dollars or fixing your rent for the month. The most famous Swedish blogger is found in Stockholm (where I am located) her blog is called Blondinbella, She is a 17 year old girl describing her life in the city of Stockholm. I am happy that she has experienced a breakthrough in the world of blogging. However, I wonder how her life will develop under the pressure of having to deliver and produce thoughts, ideas, experiences, articles and somehow function as a role model for other young girls whom devour her blogs. The media is on top of things and does everything possible to market this young woman. My hope (and prayer) is that she won’t be appeased by the attention she is getting and that she will not loose herself in the midst of it. Because that’s another side to the story; let’s be honest; it is also about self-esteem and identity! Too many of us “out there” look for confirmation, affirmation, and identity. (By the way, I am only a beginner and do not have the ambition to become “a someone” in the blog-.world, although I hope that my thoughts and ideas might somehow create spin-offs leading people to think about the purpose of life). Just imagine how wonderful it must be to be acknowledged, seen, quoted and admired for all those who might have inner struggles with questions about their purpose of life, their identity and self-esteem. I am afraid that for many it will become yet another disappointment and illusion of yet other scatted dreams. It might become the drug and create co-dependency in a world where many are looking for thrills in their lives to find some satisfaction. So, as I finish my blogging today, I remind you to be careful out there… don’t let a world of illusion rob you from your peace, rest and true identity. You’re loved for who you are… not for what you produce!